Being so simple, what will make it memorable is the quality of ingredients – in our case this month the USP was the spanking fresh hake, from the Fishermans Catch fishmongers on the pier at Clogherhead, Co Louth. So easy, so quick – soooo delicious. The time it takes the fish will depend on the thickness of the fillet: it is important to cook it until just opaque and flaking. To check that it is cooked, gently prod the thickest part of the fish with the point of a knife and the flakes should separate easily. Red Cheddar cheese may be used for a deeper coloured topping, if preferred. Cut the tomatoes in half and remove the seeds, then finely dice the flesh and place in a bowl. Finely dice the cheese and add to the bowl with the spring onions, then just bind with the mayonnaise. Season to taste. Preheat the grill to high. Arrange the fish fillets on a lightly oiled, sturdy baking sheet and season lightly, then grill for 4-6 minutes until almost tender. This will depend on the thickness of the fillet. Quickly spread the mayonnaise mixture on top and flash under the grill for another 2 minutes or until the cheese is bubbling and golden. Arrange on warmed plates with the buttered green beans and peas to serve. 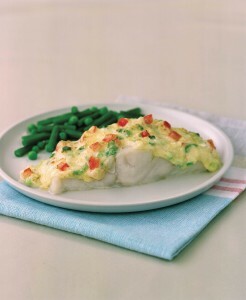 Substitute the hake with haddock, cod, whiting or pollock.